This project will be made with some differences from the original one made on purpose. 1. Fur won’t be lapin. I have had some fur remnants from when my grandma’s fur has been shortened for my mom, and it’s mink fur. It’s a pity to throw away even small parts of that.To make it short, I agree with using furs of animals we eat, and to use as possible vintage ones, as you get the fur without causing any more useless death. Which is why I will use that to trim the neck and the sleeves. 2. I wanted to make this before a perfect fabric match was found. I wanted to make this as a mockup for the white fur coat. 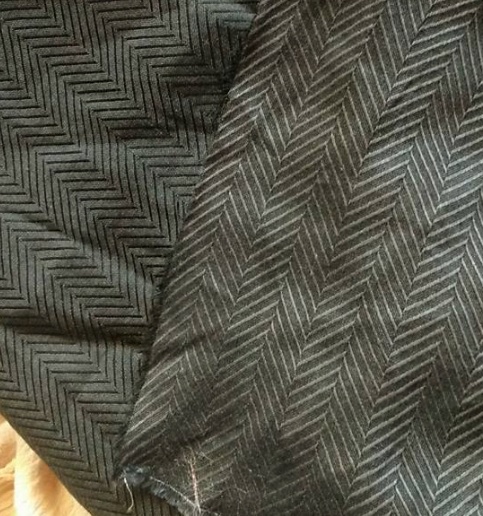 I had a herringbome fabric that gives a similar effect, bought years ago and never used, that made me change it from mockup to real thing. 3. I will add a third one too: the chain. That damn chain. I can not afford the official replica of the original one. I am waiting for some good quality galvanised 3d print, but for the moment I’ll have to use the one I made with polymer clay. Not perfect, I agree, but still not bad. 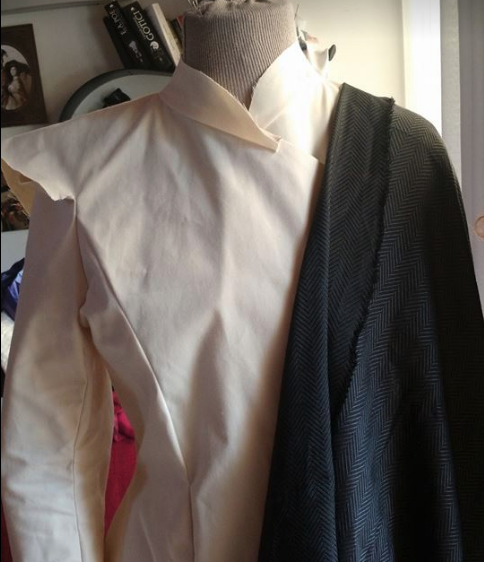 I will leave to that page all the study on the costume, and I’ll cut it down to how I’m making it. 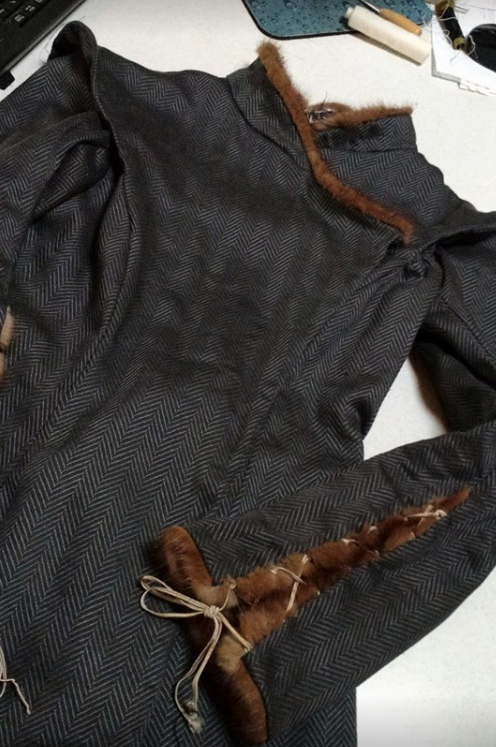 I cut the outer fabric following the placement of the original one. 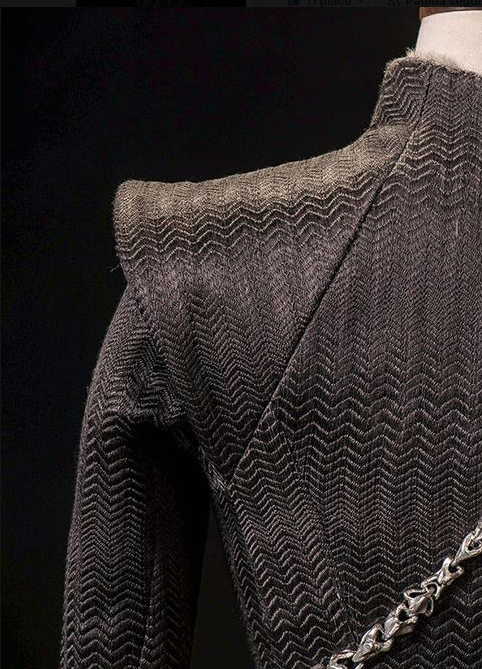 It’s all flatlined and roll basted with different types of cotton: softer on the arms and skirt, stronger on the bodice and shoulder pads and collar. 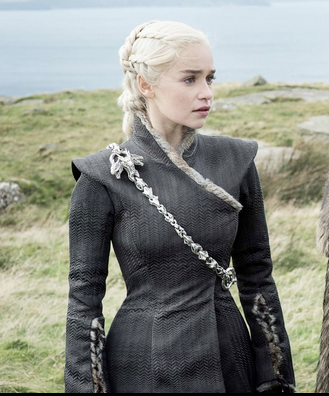 Daenerys doesn’t wear corsets, except for the corset base of the white fur coat. But all her tight fitting dresses have inner boning. 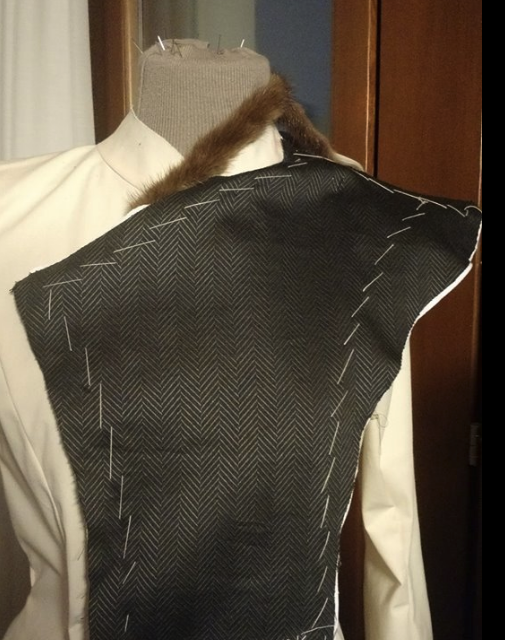 To keep things practical and avoiding double work, as I’m making the white fur one too, I took a comfortable underbust corset I had for some time, and I am using it under both the costumes. I have to say I’m quite disappointed: I looked at the last scene between her and Jon to see if there was a visible hook (when Melisandre got naked in front of Stannis and Jon I was all “Oh, yes! I knew there was a hook or snap there!! 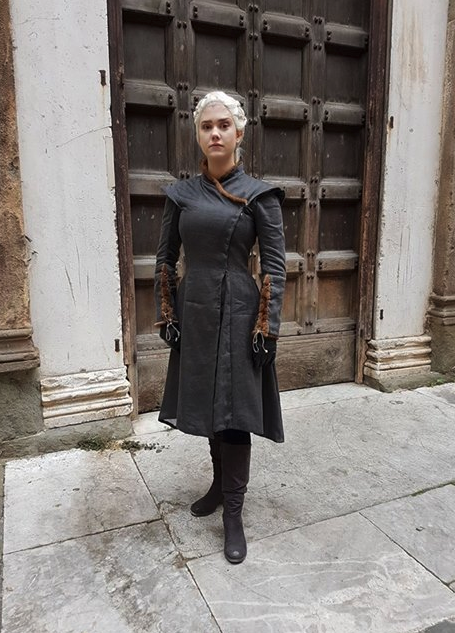 !”), but I guess they didn’t want to show he dress she would have worn underneath. I will use hooks, I think. I finished it. It fits nice. I could have used a stronger fabric to back it, but when on her it makes some wrinkles. 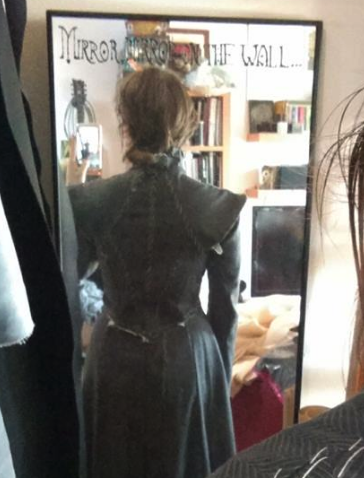 I think I will add some wool cloth inside the shoulders, just to keep them sturdy. 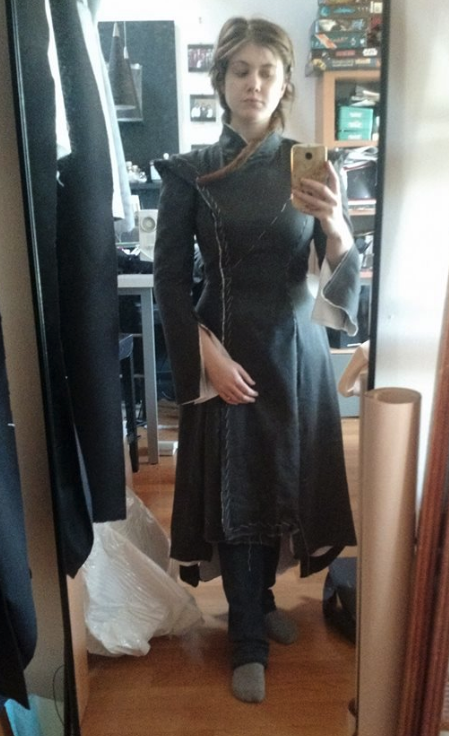 I also want to line at least the skirt with a darker fabric, as now it’s backed with a white old bedsheet.